Glass-like results without the sharp edges. Perfect for sun catchers or to decorate boxes or wood items. Available in an assortment only. Tiles approximately 1/2" x 1/2", shapes vary. Approximately 1,450 pieces per 1 lb. pack. Assorted colors. Bright Light = Easy to glue! 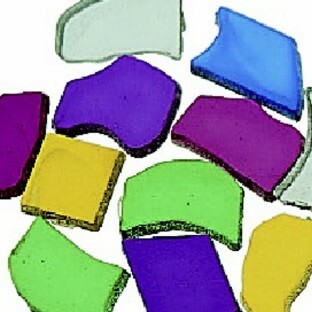 We use these LIGHT WEIGHT tiles for crafts and the kids think they are beautiful. Because they are plastic they are bright colored and VERY LIGHT WEIGHT. Using thick and tacky glue they stay VERY well on flower pots which is how we used them this season. They also make beautiful stained glass looking crosses for Sunday School with the extras as they come many to a bag. We use these to decorate flower pots and they are so light plastic that they work SO MUCH BETTER than the tiny tiles we often used to decorate the rim of the flower pots. The kids love the colors and I know we will find other uses for them as well. With a light box or with any light source like a window light box or overhead projector. Mosaic Tiles are great on a light Box! Perfect on my light box! I used these tiles for a mosaic Noah's Ark at church. I was pleased that the edges were smooth- no sharp edges to cut little fingers. The tiles were easy to use came in a variety of colors and were very light weight.